It was in the Alice B. Toklas Cookbook that we first encountered an unsweetened pumpkin pie. While this tart contains a bit of butter it’s far less rich than Alice’s with a cup of heavy cream and rich crust. This recipe is from our old website and I will begin adding these to this blog. Add yeast to lukewarm water with 1/4 cup flour. Stir and let sit in a mixing bowl until bubbly, about ten minutes. Mix 2 tablespoons butter and egg into yeast mixture. Gently add flour and salt to the yeast mixture. It should have the consistency of a soft dough. Do not knead because you do not want to develop the gluten. Form into two balls one slightly smaller than the other. Roll out the larger piece and place in an oiled 10” springform pan or ceramic tart dish. Brush with some of remaining 1 tablespoon melted butter. Cover loosely with a damp kitchen towel. Set dough for top crust aside until you are ready to fill the tart. Sprinkle pumpkin or squash with salt and cook in a steamer for 15 minutes or until tender. Drain steamed pumpkin in a colander while onion is cooking. Heat oil in large nonstick skillet set on medium heat. Add onion and garlic and saute until onion is tender and translucent about 5 minutes. Add pumpkin, thyme, sage, and pepper. Adjust heat to medium high and staute, stirring occasionally until pumpkin dice barely begin to break apart. Preheat oven to 375 degrees. Stir in rice and cheese and place filling in shell. Lightly roll out the top crust and cover, pinching the edges well together, brush with remaining butter. Cut a few slits in the top crust to allow steam to escape. Bake for 35 to 45 minutes on the medium rack until golden brown. Let sit on a cooling rack for ten minutes before serving. Serve warm or cooled as a picnic dish. Usually I substitute winter squash for pumpkins since most have a richer flavor and are drier than pumpkins. Nevertheless, there’s always room in the garden for a few pumpkins. Create a nice mound of loose soil. Scoop out the center and plant your seeds. The depression in the center makes water just a little easier since it doesn’t run off the slope. Nichols Garden Nursery is celebrating our 60th year of offering seeds and plants by mail for home gardeners across the country. It’s been a joyous ride as our family has introduced and developed scores of unique selections for home gardeners. We’ve just returned from the Portland Yard, Garden, & Patio Show and are inspired by the vitality of a gardening renaissance that includes children to great grandparents. 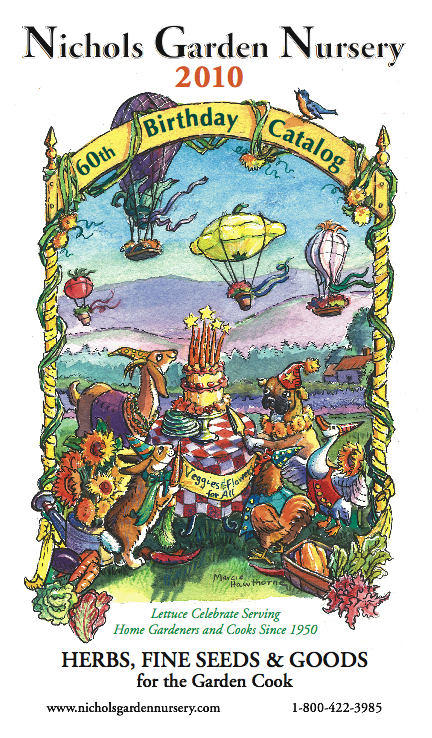 Today Keane and I learned our good friends, Pat and Becky Stone, publishers and authors, have announced the 20th anniversary of their own publication, GreenPrints “the weeders digest”. 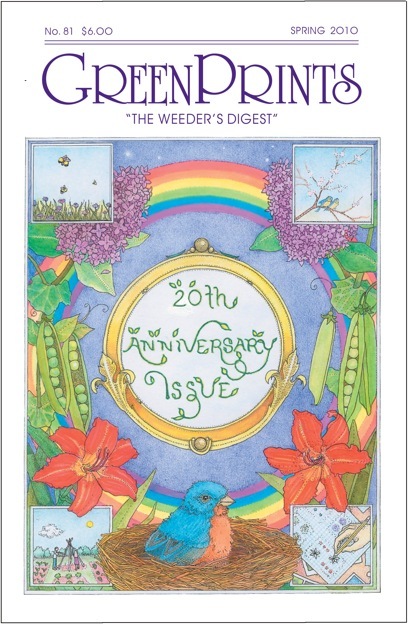 This delightful quarterly has published articles from an array of some of our finest garden writers. I find reading it contributes about equally to an understanding of gardening and humankind leaving me feeling a bit better about both. Congratulations to the GreenPrints Team!